The complete series contains all 88 episodes of this award winning TV show presented in a collectors gift box-set. Guest Stars. Ving Rhames, Lawrence Fishburne, Stanley Tucci, Jenny Agutter, Brad Dourif, Alex Winter, Adam Horowitz, Melissa Hart, Jim Dale, Adam Ant, Robert Mitchum, Telly Savalas, Macaulay Culkin, Anthony Zerbe, Amanda Plummer and Sam Rockwell, Christian Slater, Kevin Spacey, Steve Buscemi, William H Macy, Quentin Crisp, Ashford & Simpson. Original music score by STEWART COPELAND of THE POLICE. 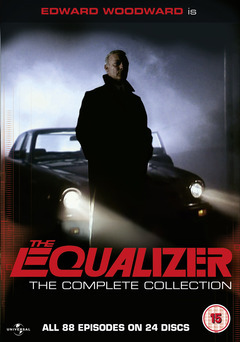 At the 1987 Golden Globe® , Edward Woodward won Best Actor in a Dramatic TV Series for his role of Robert McCall in The Equalizer. Richard Compton, Alan Metzger, Donald Petrie, James A. Contner, Paul Krasny, Bradford May, Russ Mayberry, Marc Laub, David Jackson, Gordon Hessler, Robert E. Warren,Russ Mayberry, Aaron Lipstadt, Jim Johnston, Marc Laub, Michael O'Herlihy, Jonathan Perry, Mark Sobel, James A. Contner, Luis Soto, Bradford May,Tobe Hooper,Tony Wharmby Rod Holcomb, Richard A. Colla, James Sheldon, Donald Petrie.